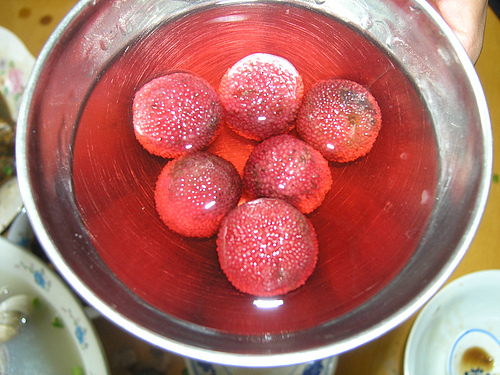 Myrica rubra, also called yangmei (Template:Zh-cp; Cantonese: yeung4 mui4), yamamomo (Japanese: yamamomo; kanji: 山桃; katakana: ヤマモモ), Chinese Bayberry, Japanese Bayberry, Red Bayberry, or Chinese strawberry tree (and often mistranslated from Chinese as arbutus) is subtropical tree grown for its sweet crimson to dark purple-red fruit. It is native to eastern Asia, mainly in China, where it has been grown for at least 2000 years, and probably also Japan and Southeast Asia as well. Chinese cultivation is concentrated south of the Yangtze River, where it is of considerable economic importance. It is a small to medium-sized tree growing to 10-20 metres in height, evergreen, with smooth gray bark and a uniform spherical to hemispherical crown. It is dioecious, with separate male and female plants. It tolerates poor acidic soils. The root system is shallow (5–60 cm), with no obvious taproot. The fruit is spherical, 1.5-2.5 cm in diameter, with a knobby surface. The surface color is typically a deep, brilliant red, but may vary from white to purple. The flesh color is similar to surface color, or somewhat lighter. The flesh is sweet and very tart. At the center is a single seed, with a diameter about half that of the whole fruit. Besides fresh consumption, the fruits are commonly dried, canned, soaked in baijiu (Chinese liquor), or fermented into alcoholic beverages. Some cultivars with large fruit, up to 4 cm diameter, have been developed. A dye may be prepared from the bark. The plant is also used as ornamental trees for parks and streets. This page was last modified on 14 November 2007, at 17:28.